Chrysler reached new heights in 2017 with the industry’s first hybrid minivan, the Chrysler Pacifica Hybrid. Returning for the second year, the 2018 Chrysler Pacifica Hybrid has been further enhanced. Now families can save more money in the long run with an investment in this revamped hybrid vehicle, full of the latest technology and generous space for all. There are three trims for the 2018 Pacifica Hybrid and they include the Touring Plus, Touring L and Limited. Seating seven passengers, this roomy minivan has a combined city/highway average of 32 MPGe, which is 10 mpg more than the gasoline version of the Pacifica, which has a combined city/highway average of 22 MPG. Carrying the 3.6L Pentastar engine, there’s quality under the hood with this well rounded, eco-friendly minivan. The Chrysler Pacifica Hybrid is equipped with a 3.6-liter V6 engine and two electric motors that combine to make 260 horsepower. The engine in the Pacifica Hybrid is similar to the 3.6L Pentastar V6 engine in the Pacifica, but engineers have made some changes to improve its efficiency as well as make it compatible with the electric system.The Pacifica Hybrid can be powered in one of three ways, only by the battery, only by the engine, or a combination of both. Fuel economy is a driving force behind the Pacifica Hybrid’s award-winning success and drivers can expect to make less visits to the gas station and save money. When the Pacifica Hybrid is only powered by the 3.6L engine, the Pacifica Hybrid has a combined city/highway fuel economy of 32 MPG, which is 10 miles more than the city/highway fuel economy of the Chrysler Pacifica. The Chrysler Pacifica Hybrid has a combined city/highway hybrid (electric system and engine working together) fuel economy of 84 MPGe and a total driving range of 566 miles. When only powered by the dual motors and battery, the Pacifica Hybrid can travel up to 33 miles, which means there are no tailpipe emissions released during those 33 miles. Using the standard level 1 charger (140-volt), the 2018 Pacific Hybrid can be fully charged in 14 hours. Upgrading to the standard level 2 charger (240-volt outlet), the battery can be 80 percent recharged in two hours. For fast charging at all times, a level 2 charger can be installed into an owner’s home. The Pacifica Hybrid was designed to be convenient and efficient, so the cabin was designed to block out exterior noises and to make little noise on the interior. To keep everyone comfortable on a long drive, there is a three-zone A/C system. The spacious cabin is available cloth or leather and there are several places for passengers and the driver to charge their mobile devices while on-the-go. The Pacifica Hybrid has tons of storage space and storage options. Thanks to Chrysler’s innovative Stow ‘n Go storage seating system, the Chrysler Pacifica Hybrid has plenty of cargo space and has exactly 243 seating configurations. A beautiful ride with a tall and long frame, the Pacifica has a noticeable sleek frame. Buyers have the option of 10 different exterior colors and the option of a chrome grille or black grille. The Pacifica Hybrid comes standard with power sliding doors and the Pacifica Hybrid Touring L and Pacifica Hybrid Limited come standard with a power opening liftgate, which is an available feature on the Pacifica Hybrid Touring Plus. The award-winning Tri-Pane Panoramic Sunroof is an available option on the Pacifica Hybrid Limited. All of the Pacifica Hybrid trims come standard with all-season tires and the Pacifica Hybrid Touring Plus and Touring L trims ride 17-inch aluminum wheels and the Pacifica Hybrid Limited rides on 17-inch polished aluminum wheels. For extra convenience at night, the Pacifica Hybrid is equipped with premium fog headlamps and halogen quad headlamps in the front and LED tail lamps in the rear. Boasting standard six-speaker with available 13-Alpine or 20-Harmon speaker systems, the 2018 Chrysler Pacifica Hybrid provides different tiers for music lovers. The 2018 Pacifica models come standard with a touch screen of 7 inches with an available 8.4 inch screen in certain trims. 2018 Pacifica Hybrid models come standard with the latest version of Uconnect, Uconnect 4.0 which includes Apple CarPlay, Android Auto, and integrated voice command with Bluetooth technology. An impressive Uconnect Theater Package exists, providing dual screens, Blu-Ray DVD players with included wireless headphones. Every 2018 Chrysler Pacifica Hybrid has Advanced Multistage Airbags, ParkView Rear Backup Camera, Sliding Door Warning, and Tire pressure monitoring features standard. In addition, available options (many of which are available as standard in the higher trim levels) include Brake Assist, Full Speed Forward – Collision Warning, Blind Spot Detection, and Lane Departure Warning. 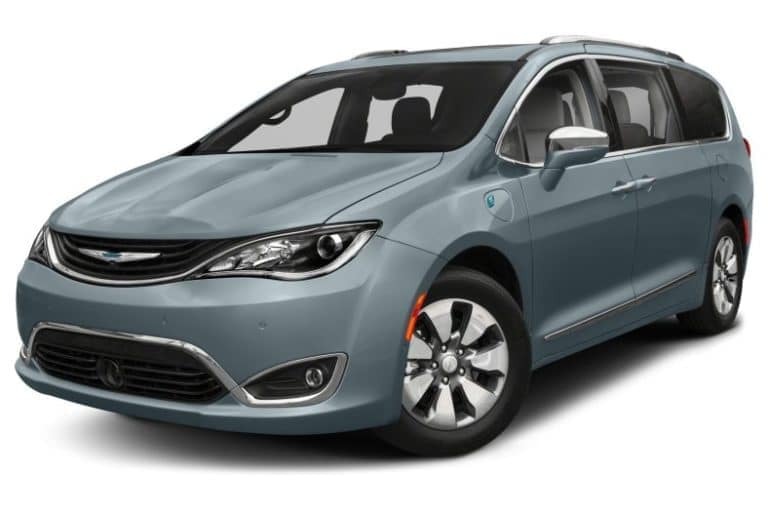 The Chrysler Pacifica Hybrid Touring Plus has a starting MSRP of $39,995 (plus destination fee) and the upper-level trim, the Pacifica Hybrid Limited has a starting MSRP of $44,995 (plus destination fee). The Pacifica Hybrid qualifies for a $7,500 federal tax credit, so buyers can apply for the credit when filing their taxes for the year the purchase was made. Warranties include a three-year or 36,000-mile limited basic warranty and a five-year or 60,000-mile limited powertrain warranty on gas engines, and the battery in the Pacifica Hybrid is backed by an 8-year or 100,000-150,000-mile warranty (depending on the state). Hollywood Chrysler Jeep is located just outside of Miami, and we have a great selection of Chrysler and Jeep vehicles. Visit us at Hollywood Chrysler Jeep for a test drive of the brand new Chrysler Pacifica today.